Mint from the growers market has many people thinking of cool, refreshing mojitos. Maybe it was the story about Ernest Hemingway’s mojitos that Paul and Barb Prior of Gourmet Gardens told me. Or maybe it was the memory of adding fresh mint to tea last summer. 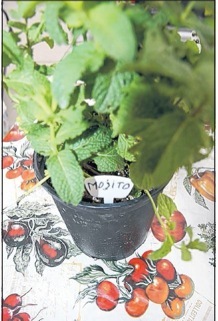 Something inspired my impulsive purchase of a mojito mint plant at a recent Friday afternoon growers’ market. Because by the time I got home, I was ready to brew a large jar of ice tea and try my hand at bartending. Finding the unexpected at your local growers’ market is one of the great pleasures you can count on during the summer growing season. Receiving the extensive knowledge of the farmers who grow the food that they bring to market is an added bonus. “Did you know this is the real mint used in mojitos?” Paul asked me. He rubbed a leaf between his fingers to release the scented oil. I was hooked. Is there really a mojito variety, I wondered when I got home. Turns out there is: Mentha x villosa is the Latin name for the variety of Cuban mint that has a particularly mild and warm scent and flavor. It’s neither too pungent nor overly sweet. If the past few days are any indication, I would add that it also has a mildly addictive quality. But fresh mint is just one surprise among many that you might find at a growers’ market this time of year. That’s because as we head straight into the middle of summer, a full range of locally grown produce awaits those who get to market for the best-tasting and freshest food available. Squash blossoms, lettuce mixes, English peas, sugar snap peas, snow peas, swiss chard, arugula, dill parsley, basil, cilantro, oregano, young onions, fresh garlic, potatoes, green onions, carrots, beets, broccoli, cauliflower, Russian kale, Tuscan kale, rainbow chard, bok choy, tatsoi (an Asian green), radishes, honey, turnips, eggs, cheeses, milk, butters, meats, breads and more. As the weeks pass, expect to add more peak season crops to the list like squash, cucumbers, beets, green beans, and of course, tomatoes. If you’re wondering how the local fruit crop will be this year, unfortunately the answer is not so good. The many late frosts this spring were devastating for early blooming trees like apple, peach and apricot. According to a number of orchardists from Belen to Velarde, their apple crops are completely wiped out. There are probably still a few trees that escaped the frost (either by location or with the help of large mechanical fans that push warm air toward the ground) but overall, this will not be a repeat of last year’s bumper crop of fruit. Blackberries and raspberries that bloom later may have escaped the worst frosts, and soon we’ll find out just how these crops are faring this year. Later still, look for wonderful local melons. When the weather gets hot, fresh food and cold drinks are your friends. 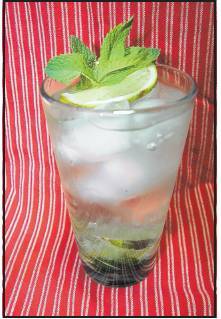 If you have some mint on hand, try a mojito or another fabulous drink. If you’re lucky, you might even start to hear the ocean. There really is a variety of mint specifically for mojitos: Mentha x villosa. It has a mild scent and flavor and is neither too pungent nor too sweet.